Signs like these mark the evacuation to higher ground in Washington's coastal communities. Washington doesn’t usually have extreme weather like tornadoes or hurricanes, but settles for a milder, more rainy climate instead. However, our coast was under a tsunami advisory after Japan’s 8.9 magnitude earthquake and resulting tsunami last week. We escaped without damage this time, but southern Oregon wasn’t so lucky. Brookings, Oregon, sustained several million dollars in damage. We have “tsunami evacuation route” signs, in our coastal communities like Aberdeen, Hoquiam, Long Beach, Ilwaco and Ocean Shores, for a reason. They weren’t erected just to give a sign maker more business. The danger to us is real. The Cascadia Subduction Zone, one of the largest active faults in North America, runs parallel to the Washington Coast – 32-70 miles offshore. Researchers say it will cause a giant earthquake and a tsunami. The question is when. No one knows the answer. 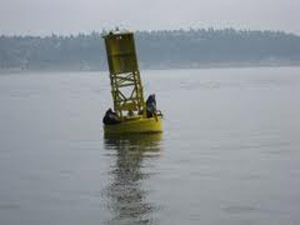 Sea Lions rest on a buoy in calm Puget Sound waters. This entry was posted in Beaches, Towns, Uncategorized and tagged Aberdeen, Brookings, Cascadia Subduction Zone, evacuation route, Hoquiam, Ilwaco, Japan, Long Beach, Ocean Shores, Oregon, tsunami, Washington Coast on March 15, 2011 by admin.